World-renowned platinum-selling Blues-rock singer-songwriter and guitarist Joe Bonamassa will perform two very unique all-acoustic shows at the iconic Carnegie Hall in New York City on January 21 and 22, 2016, promising an evening of extraordinary music with new arrangements of favorite songs as well as brand new, never-before-heard songs. Both performances will be filmed for a future DVD release and will air on Public TV and Palladia. Leading up to the shows at Carnegie Hall’s Stern Auditorium / Perelman Stage, Bonamassa will tour a select number of cities along the east coast including Hagerstown, MD, Virginia Beach, VA, Reading, PA, Easton, PA, Burlington, VT, Portland, ME and Kingston, NY. On this very special all-acoustic run, the guitar player will be joined by an all-star ensemble of world-class musicians, including the acclaimed Chinese cellist and erhuist Tina Guo, who’s repertoire stretches from classical to heavy metal; and Hossam Ramzy, the Egyptian percussionist and composer, who has performed on dozens of film soundtracks and records, and was the percussionist on Jimmy Page and Robert Plant’s No Quarter: Unledded Tour. Reese Wynans (piano), Eric Bazilian (mandolin, hurdy-gurdy, saxophone, acoustic guitar, vocals), and three backing vocalists, Mahalia Barnes, Juanita Tippins, and Gary Pinto, round out the ace band. Everyone knows the old saying about how to get to Carnegie Hall, but Bonamassa has truly lived that advice. His entire life and musical career has been practice for this moment, and a young blues-boy is finally making good on his childhood dream of playing one of the most hallowed stages in the world. This stripped down, all-acoustic show will truly allow his fans a glimpse into his soul and presents a thrilling and musically dangerous spectacle akin to walking a tightrope without a net. Don’t miss this once in a lifetime opportunity to watch Joe Bonamassa join the pantheon of musical legends to have played this one of a kind venue. About Joe Bonamassa: As Joe Bonamassa enters his 26th year as a professional musician, he continues to blaze a remarkably versatile artistic trail, and amass an authentic, innovative and soulful body of work. Bonamassa’s career began onstage opening for B.B. King in 1989, when he was only 12 years old. Today, he is hailed worldwide as one of the greatest guitar players of his generation, and is an ever-evolving singer-songwriter who has released 22 solo albums in the last 15 years, all on his own label, J&R Adventures. He founded and oversees the non-profit Keeping The Blues Alive Foundation to promote the heritage of the blues to the next generation, fund music scholarships, and supplement the loss of music education in public schools. 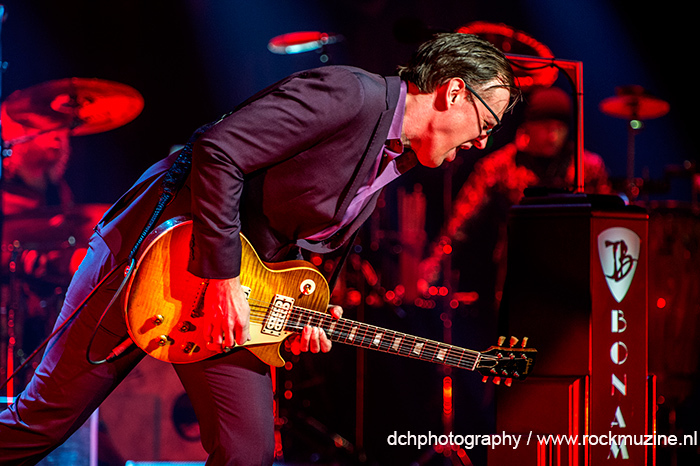 In 2013, Bonamassa earned his first GRAMMY ® nomination for Best Blues Album and in 2015 his 15th #1 Billboard Blues Album (more than any other artist) with the release of Live At Radio City Music Hall. 2014’s Different Shades Of Blue debuted at #8 on Billboard’s Top 200 and was his highest charting album, first top 10, and biggest sales week ever. Billboard honored him with the 2014 Best Blues Album Award and as their Blues Artist of the Year; he also won Blues Music Awards’ Best Blues Guitarist. Bonamassa will fulfill a childhood dream when he headlines two shows at the iconic Stern Auditorium / Perelman Stage at Carnegie Hall in New York City in January.